Generate Swift models from a JSON string. Is there a better alternative to CuteBaby? Is CuteBaby really the best app in Developer Tools category? Will CuteBaby work good on macOS 10.13.4? CuteBaby generate Swift models (struct or class) from a JSON string. 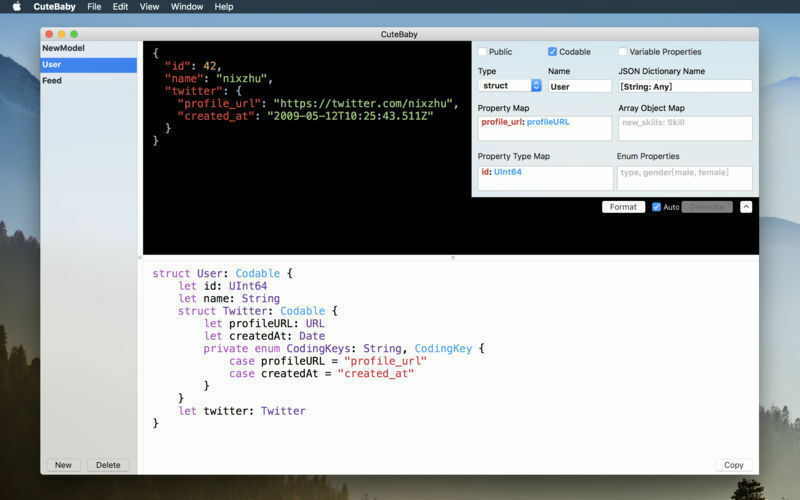 It can detect property's type from JSON, such as String, Int, Double, URL and Date. It can handle nested JSON, it will generate nested models. It supports Codable from Swift 4. You can specify property’s name with Property Map, array’s object name with Array Object Map, or enum's definition with Enum Properties. It can also handle array root JSON, it will automatically merge properties for objects in the array. It can format JSON with pretty printed. CuteBaby needs a rating. Be the first to rate this app and get the discussion started! It can load JSON from a URL.